I feel like I have been waiting my whole life to teach my child to read. It’s such an exciting time! There are so many resources out there, and I have used a lot of them. 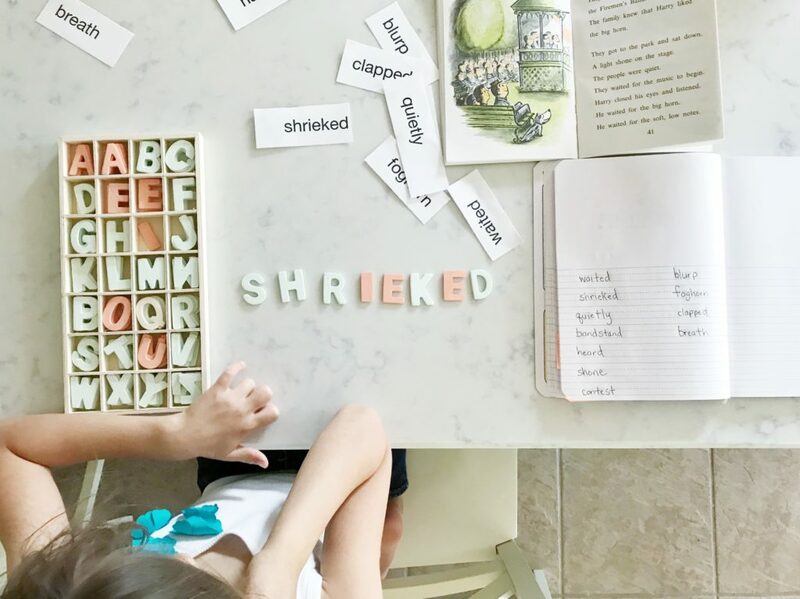 I shared how I started off teaching my oldest child to read way too soon in this post, but I was quickly reformed and let her begin leading the way until we started formal lessons when she turned 6. I have enjoyed several resources that I credit with my daughter learning to read including The Ordinary Parent’s Guide to Teaching Reading which we used to learn the letter sounds and Bravewriter’s The Wand which we use for phonics and grammar. Despite all of the amazing resources, I still struggled with how I was supposed to teach my daughter to read. She showed all the signs of being ready and was very interested in learning, but she wasn’t making the connection between the random sight words we were learning and the phonics lessons we were doing. Our homeschool has been inspired by Charlotte Mason, a 19th century British educator who trained teachers in her methods. So much of what she proposed seems like common sense, including the way she taught reading. I encourage you to read what she says for yourself in Part 5 of Home Education. I don’t mean for this to be an all-inclusive resource for teaching reading. There were many steps we took to get to this point including starting with teaching the alphabet. I hope to fill in more of the steps with blog posts eventually, but for now I’m sharing where we are. Once a child knows his letter sounds and can begin to put the sounds together to build words, Charlotte Mason outlines two types of reading lessons. The first is what we can call a sight lesson. It is not learning sight words like most schoolchildren do today, but instead learning to read by sight. Following a sight lesson, would be a sound lesson. A sound lesson would include more of what we consider phonics and spelling today. It is learning to read by learning the different combinations of letters and the sounds they make. In Home Education, Charlotte Mason actually details an entire reading lesson with a child. It is so informative and inspiring to see the method in action directly from the source- go check it out! While I aspire to teach reading the Charlotte Mason way, I am operating under the constraints of modern day life, being a mother of 3 young children, and having a unique child with her own strengths and challenges. Our reading lessons look a little different each day, but we generally follow Charlotte Mason’s framework. I am going to share the framework that I use and some variations we may include. But first, here’s a real life reading lesson with my 6 year old. I wish I had done this sooner with her because she has almost graduated from this type of lesson so we don’t do it exactly how we did when we started reading. When my next child turns 6, I’ll update with a video of our beginner lessons! I still think it’s valuable to share this because you can see how these steps will progress, and how a child can learn to read with this method. We are reading a verse from The Flowers in A Child’s Garden of Verses. There are surely worse ways to oppress your child, but let’s agree that Bob books are not the most engaging and enticing way to teach a child a love of reading themselves. So what do I use? Real poems and real books. Start with any simple nursery rhyme or song like Twinkle Twinkle Little Star or Hickory Hickory Dock or Little Bo Peep. You can also begin with classic stories. The Treadwell Readers are a perfect all-in-one resource for this. The Primer is ideal for beginning readers. Another option is to use real books. Books like A Kiss for Little Bear, Frog and Toad, and Chicken Soup with Rice are Mr. Putter and Tabby books are fun options that most children will love. Children’s poetry also makes a great beginner reader. Some of our favorite poetry resources are A Child’s Garden of Verses, Side by Side Poems to Read Together, and Favorite Poems Old and New. Select a portion of your reading material to focus on in the lesson, typically 2-4 lines. The goal is to learn about 10 new words a day. You will need to type the lines of the poem/verse/story you are using. Ensure it is in a large readable font, and print several copies of it. Charlotte Mason suggests six copies, but I found my daughter only needs 3-4 duplications of each word. I like to laminate the sheets, and then cut them out so that I can use these lessons with my younger children one day. Put all of the cut out words in a bag or little box to store until your lesson. I document all of our reading lessons in our reading notebook. We use a primary composition notebook with the wide lines because sometimes my daughter wants to write the words down herself. Remember, there are two types of Charlotte Mason reading lessons. The following framework is for sight lessons. That means we are not focused on phonics rules, spelling, or the way the words sound- that will come in the next lesson. This lesson is focused on teaching the child to recognize words by sight. The child should look at the word until he is sure he would know it again. In the video, I tell my daughter to take a picture in her mind. Then the child makes the word with loose letters. My daughter loves to write and often requests to write the words on the chalkboard instead of building them. This isn’t about writing though, so if that’s a challenge for your child, stick with the loose letters. Or alternately, you can write the word in the air with your hand or use a tray of sand to write the words. 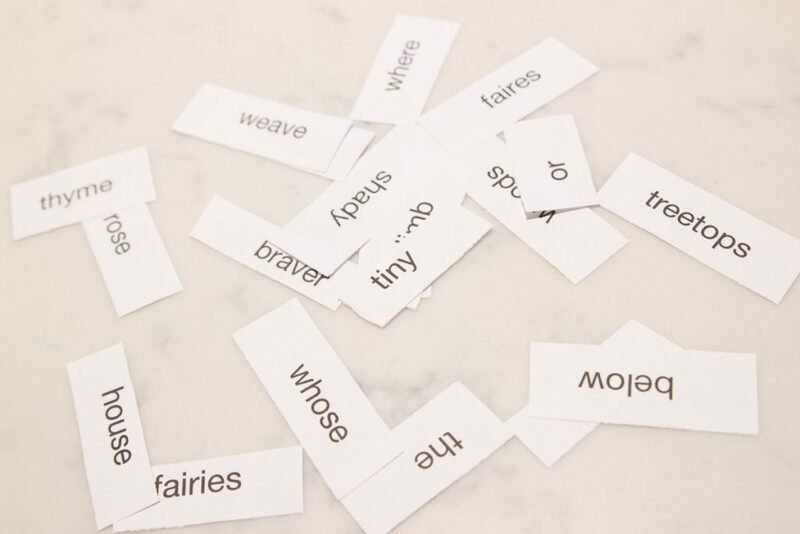 Next, shuffle the cut out word cards from your word box and place them in front of the child for him to find the word. You should have multiple copies of the word, and he should find it multiple times. Now, show the child the complete reading selection and have him find the word. If you are using an actual book instead of your own printout, I like to cover the rest of the selection with a blank sheet of paper and only show the two lines we are working on. Finally, add the word to the word list in your word notebook. I sometimes pre-write this list, but my daughter does like to add words herself sometimes so I try to do it as part of the lesson. Repeat these steps for each word in your selection. It seems like a lot for one word, but it goes faster than you think. When the list is complete, read the list of words up and down from top to bottom and bottom to top. If you’d like this printable checklist with this framework, you can access it here. When the child knows all of the words, it’s time to put them together into a sentence. Dictate a short 3-4 word sentence and let the child use the cut out words to form the sentence. Let the child read the sentence. Do this several times using the words in different combinations, but avoid sentences from the actual reading selection. Once the child has learned the power of creating his own sentences, dictate the original reading selection. The child will form the sentence with his cut out words, and read it. This is a magical moment! At the pace of 10 words a day, your child will be building up knowledge and storing up these words to take off reading in no time. Coupled with sound lessons (future post! 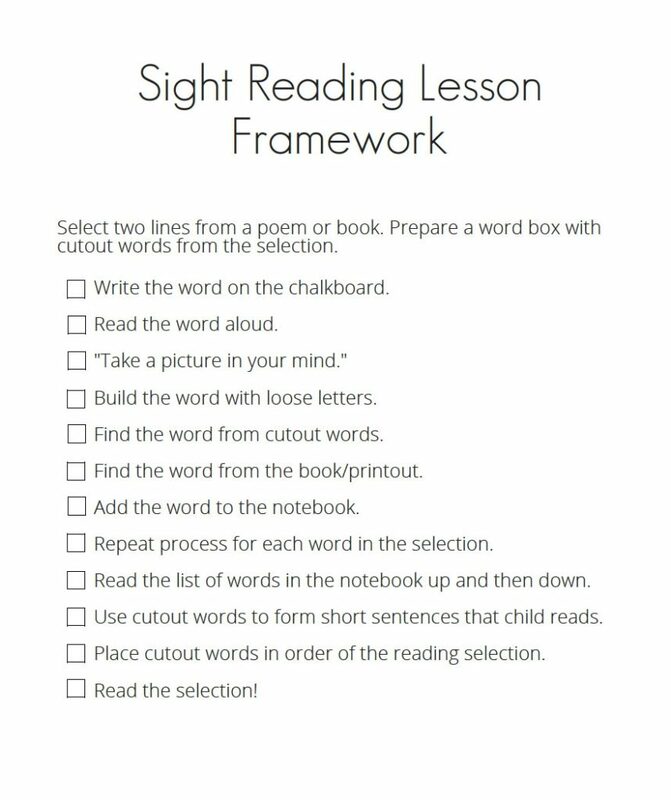 ), these sight lessons are the foundation of teaching a child to read in a simple, no-stress way. If you need more help in the how-to department, I’d recommend this excellent blog series by Joyful Shepherdess outlining all of the steps to teaching reading CM-style. 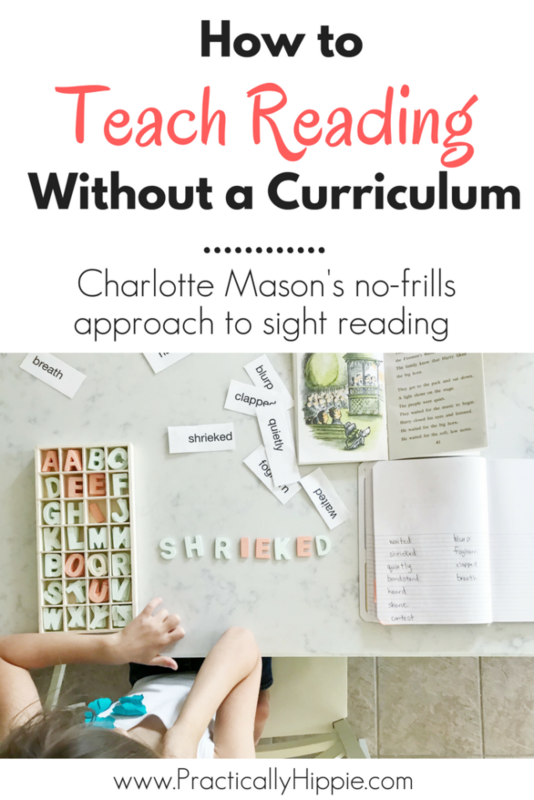 Did I answer your questions about teaching reading with Charlotte Mason lessons? Do you have more questions? Leave a comment and I’d love to see if I can help. I love this post! It confirms how I taught my daughter to read to be true. Its very effective and not a drag to teach readjng in this way. Not to mention very cost effective. No need for fancy phonics programs. I love your wooden letters. So cute. Thank you! Love hearing that it worked for you too! Isn’t it funny how the simplest and most cost effective solutions are often the best?! HI there! This was really great. I am teaching my 6.5 dd to read right now. I would love any info on the sound lesson as soon as you can post about it. I need to go dig out my moveable alphabet. I should have something up next week! Be sure to read the section on reading in Home Education Vol. 1 starting on page 199 to get the full picture! Hi! Do you have an example of a sound lesson you could share? I’m trying to wrap my mind around the two lessons and how to use them. Thank you! Would there be any kind of review of previous learned words? Or do you just let the review happen naturally when you come across the word on a different day during a different part of the poem/story? 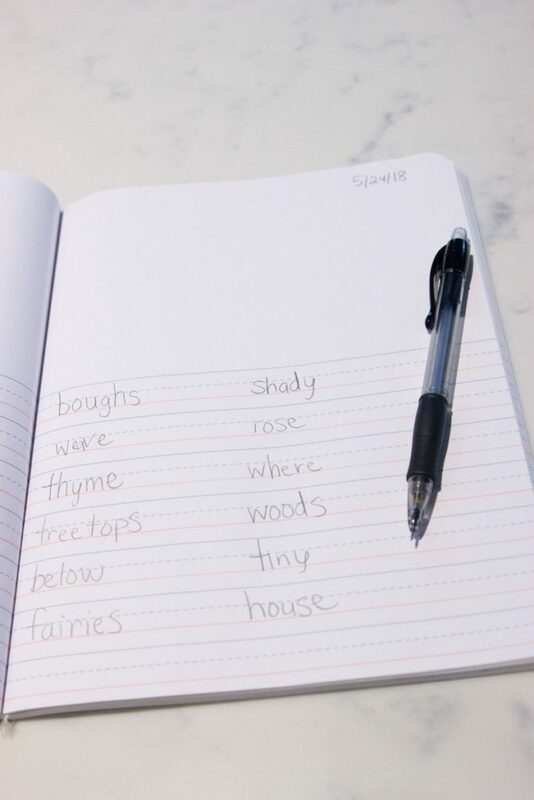 Review tends to happen naturally with each lesson because high frequency words appear often, but if there were some trickier words we could definitely go back and review a list before/after a lesson if we had some extra time. I’m still patiently waiting for your sound lesson for reading ?? any idea if you still plan to work on that? Thanks for the nudge, Christine! My daughter started reading so well write when I wrote that, so I never ha a chance to make a video. But I will go ahead and write up our process for sure- look for in in the next week or so!